We had such a great time at Leatha’s Bar-B-Que Inn, and their barbecue sauce was something special. It was full of tomato and vinegar flavor, with a light sweetness and a savory onion, garlic and black pepper base. We loved it so much, we bought some of their sauce to take home. We were really excited to dive in and use it on some of our own home-smoked barbecue, but when we opened the bottle, it seemed too ketchup-y and lacking in the nice broad spiciness the original had. So we decided to make our own barbecue sauce. We also went big, and made enough to bottle. We took inspiration from Leatha’s ingredient label and our memories, but gussied it up to our tastes with white and brown sugar and cider vinegar. This is tomato-y and sweet, with a nice underlying heat and spice. It is an easy sauce to make, and if you make it in bulk like we did, you can bottle it and keep it for a good long while. This made 13 lucky pints of goodness. —that was the biggest one they had at the Walmart. If you go to the big box stores, you can buy giant gallon cans. That’s only 14 ounces more than what I used, and it will make no real difference overall. Just adjust things to your taste as you go. Finally, add 10 cups of water. Of course I underestimated the volume of this so I had to switch to my . I’m really glad I have a turkey roasting pan. Now it’s time to bottle this magic. Bottle it and sterilize it via the water bath method. You need , and can get them pretty inexpensively at the big box stores. Make sure you get one with a inside. That’s the thing to the right of it, on the counter. Fill up the pot so that the water will cover the jars by 2 inches, and get it boiling hot. I like to heat up the kettle next to it too, so that I have extra water hot and ready, just in case I need it. Fill clean, new, sterilized within 1/8 inch from the top with hot barbecue sauce and process in that boiling hot water bath for 15 minutes. 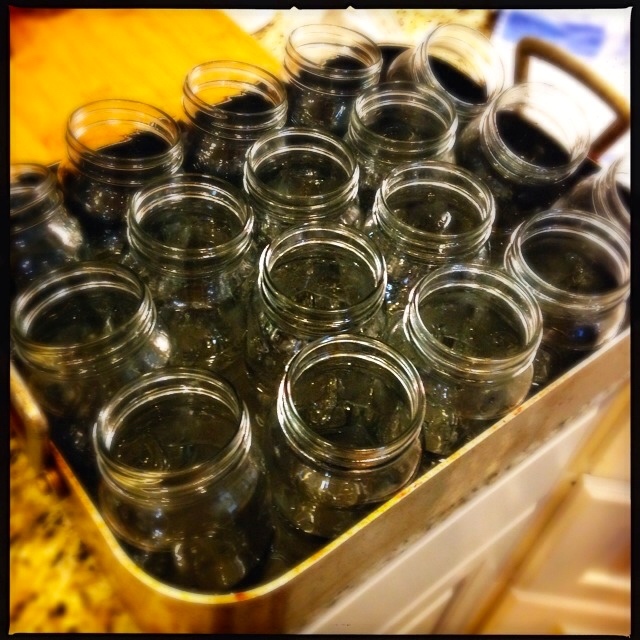 Make sure the jars are covered by two inches of boiling water while they process. Pull the bottles out after 15 minutes of boiling, let them cool and listen for the pops as the jars seal, check the seals and tighten the mason jar twist lids, add a mighty nice label (or do what I do and just write on it with a magic marker), and stock them in your pantry. This is tomato-y and sweet, with a nice underlying heat and spice. 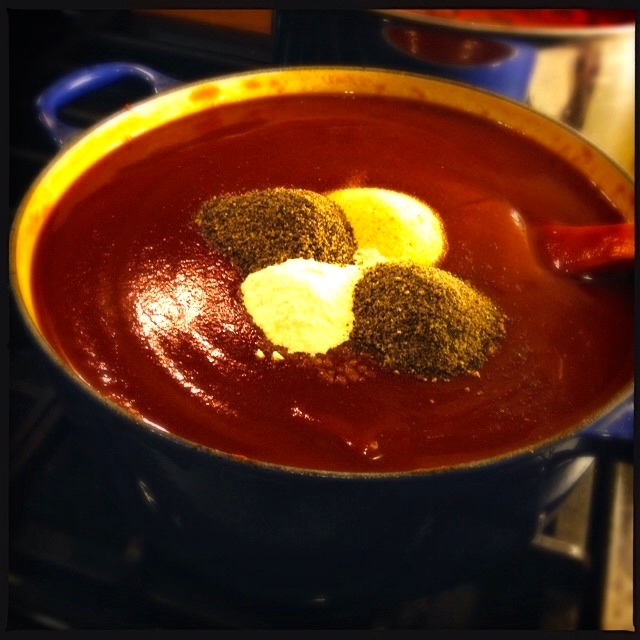 It is an easy sauce to make, and if you make it in bulk like we did, you can bottle it and keep it for a good long while. This made 13 lucky pints of goodness. Bring to a boil and cook it for 10 minutes, then cook over medium heat for 30 minutes more. Bottle it and sterilize it via the water bath method. 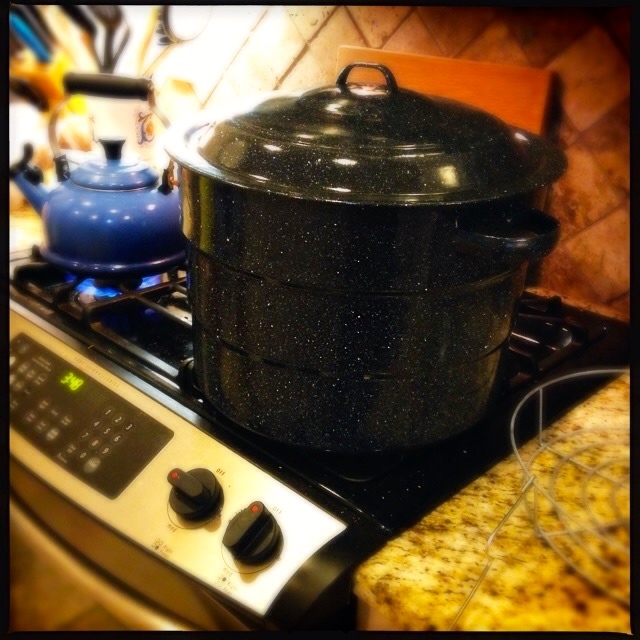 You need a giant pot for this, and can get them pretty inexpensively at the big box stores. Make sure you get one with a bottle rack inside. Fill up the pot so that the water will cover the jars by 2 inches, and get it boiling hot. I like to heat up the kettle too, so that I have extra water hot and ready, just in case I need it. 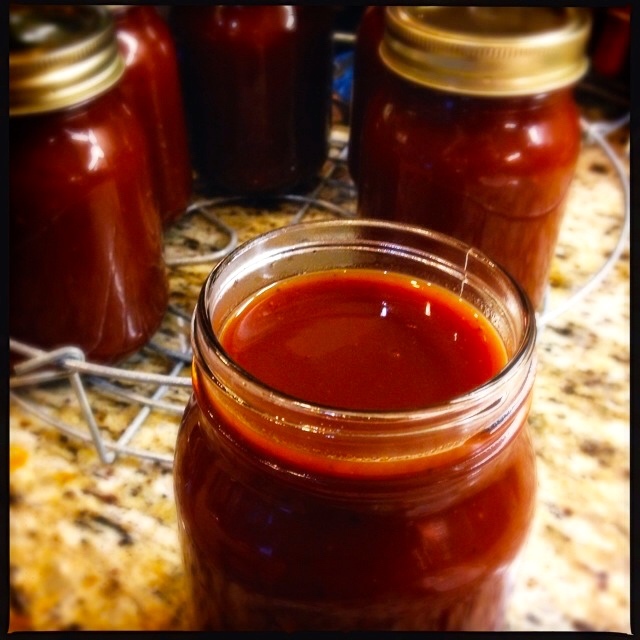 Fill clean, new, sterilized glass mason jars within ⅛ inch from the top with hot barbecue sauce and process in that boiling hot water bath for 15 minutes. 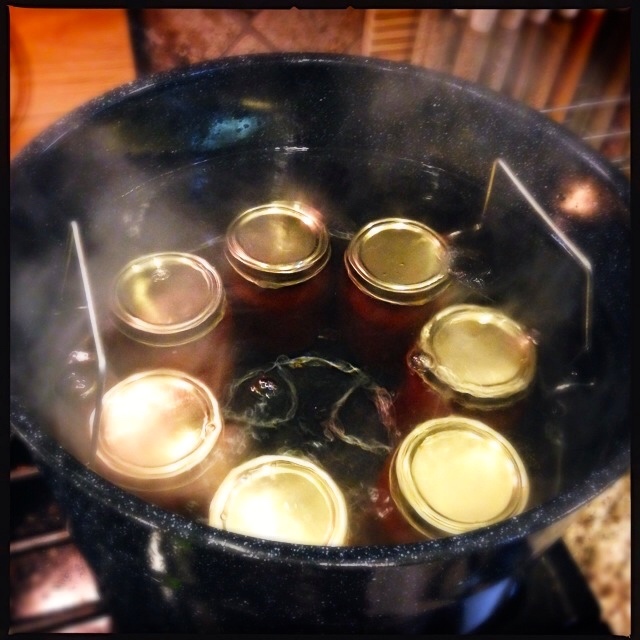 Make sure the jars are covered by two inches of boiling water while they process. Pull the jars out after 15 minutes of boiling, let them cool and listen for the pops as the jars seal, check the seals and tighten the mason jar twist lids, add a mighty nice label (or do what I do and just write on it with a magic marker), and stock them in your pantry. Hi! Thanks for the tips, how long does the sauce keep for roughly? Ikepo, it keeps a couple of years if you do jar it using the water bath method. I store it in my pantry and check and make sure it is still sealed before I open it. If it doesn’t look or taste right or has fermentation signs, toss it out! How long does your sauce last once it’s been opened? So if I’m giving it as a gift what’s the fridge life on it ? That’s a great question! My general go-to is to try and use within two weeks of opening. (While originally sealed it lasts just about forever. At least a couple years.) Since this has been cooked and canned, you might get far longer when opened. I keep my fridge cold and only pour out of it, not dip food into it, and get a month or two just fine. I toss it after a month or so, so I make it in little jars of 8 or 16 ounces, so it’s always fresh. I hope you enjoy your sauce!!! You’ll want to bottle yours in a local commercial kitchen following your local health laws, or contact what is called a co-packer. Search for one on Google. Hey I saw you comment about bottling your own sauce I want to do the same….I just emailed you to ask how is it going?….And what did you have to do? Hey Kyle, so you just need to follow the recipe from above. That will guide you through the process. 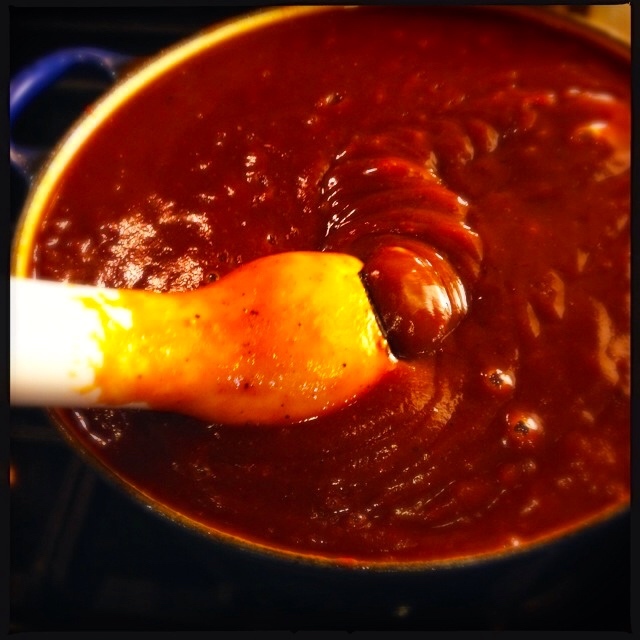 You’ll want to water-process your barbecue sauce when you’re done, to seal the jars up from the bad stuff. Good luck! 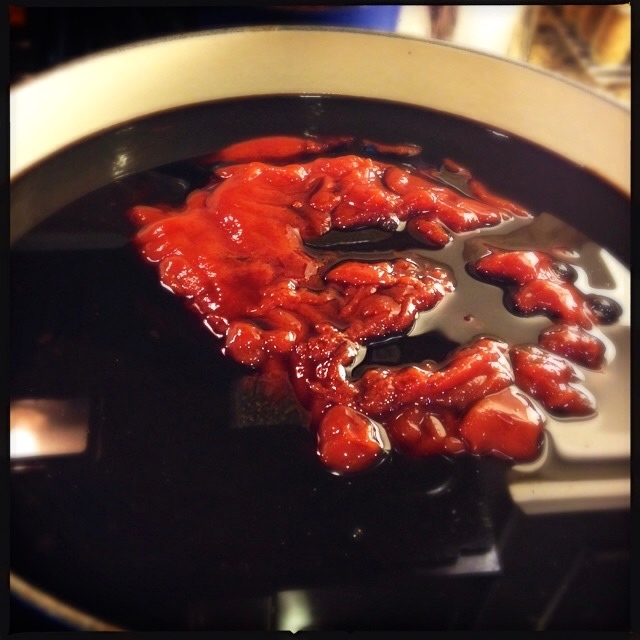 Hey woopigfoodie, I want to bottle and sell my bbq sauce.Can I use ketchup instead of tamato puree are tamato paste? Yes, you sure can. Most folks use a ketchup base. You can buy in in the big gallon cans over at the warehouse store. Hi there! This looks awesome! Is there any adjusting I need to do if I put the sauce in smaller jars? Thanks! Hi TD! You’re good to go, no changes to the recipe needed for smaller jars. You’ll still heat them as long, but since you’ll just cover the jars with an inch of water you’ll be putting in less water in the water bath than if you used larger jars. That will making the preserving step faster! Good luck! Does it thicken after its cooled? Yes, Tabetha! It will thicken as it cools. 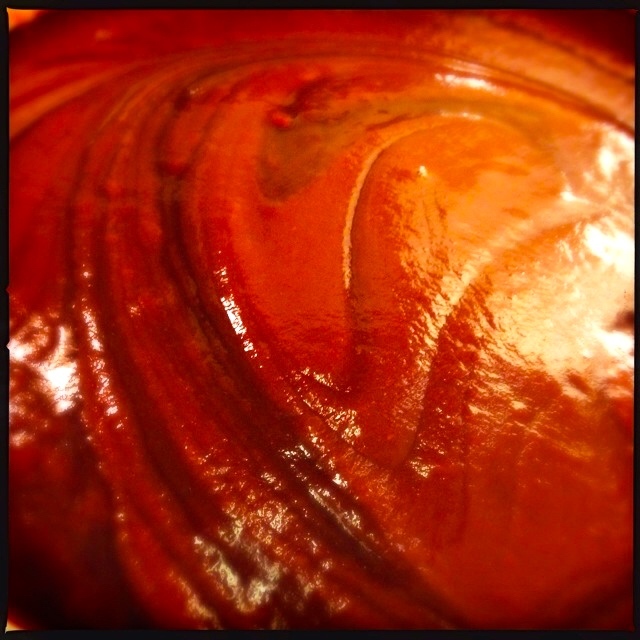 You can keep reducing it in the pot to make it even thicker if you don’t think it is thick enough. 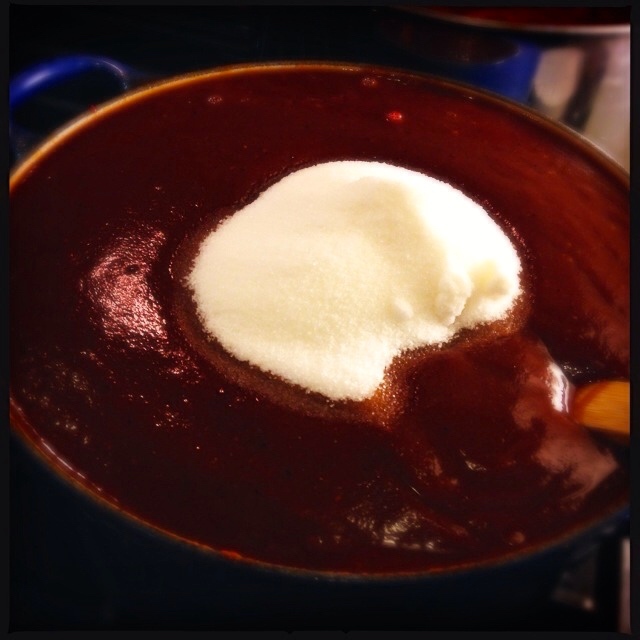 If you’ve already canned it and only later think it’s too thin, you can also pour one jar into a pot and reduce it over medium low heat for about 40 minutes, stirring occasionally until it reduces down. Have fun!!! What if you didn’t do the hot water bath how long will the sauce last? Hi Jenna! 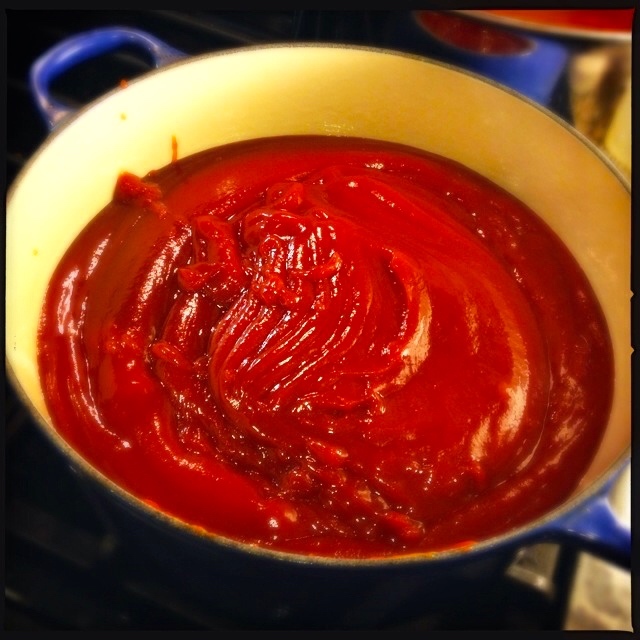 It will generally last as long as any other homemade sauce. So, maybe a month in a cold fridge. Perhaps 6 months if you were to freeze it. The water bath process is super easy to do, so if you plan on making a batch for keeps or gifts you should definitely do the water bath method! Have fun and be safe! Is the 10 cups of water for the canning process? Or does this actually go into the sauce? Seems like a lot of water. Hi Jeremy! Yes, the 10 cups of water are for the sauce. (This makes about 4 gallons.) For the water bath, it takes about 3-4 gallons of water, too. 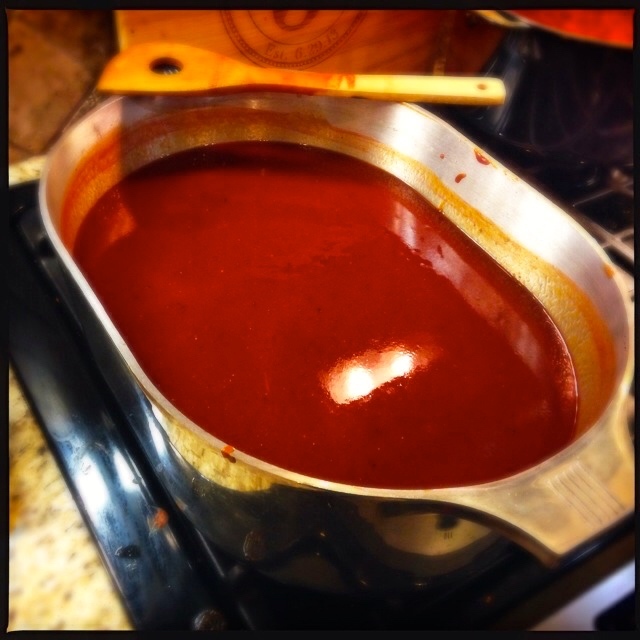 When making the sauce, add more or less water to get to the thickness you prefer! Just so you know it doesn’t look like your recipe on the bottom doesn’t have the Worcestershire sauce. Thank you Aaron! I have it fixed now! So, I was thinking of using this recipe but putting it in 12 oz bottles with lug lids. Would the water bath processing time and jar head space stay the same? The last thing I want to do is get someone sick by not processing it correctly! Thanks for helping out this newbie. Hi Catherine! I have only used the screw down Ball-type lids before, but yes,even changing to this size you will process for the same time and cover with the same amount of water. I used the timing and instructions for the ketchup recipe from my Ball jar cookbook to come up with that so feel free to explore Ball on the web further! Just find a recipe that looks tasty and follow the above bottling instructions.